TattooRunner: Wild Horse ripper Easter Day! me living it up at Caloundra pre-race. Easter Sunday 2013 saw the Grills’ family first outing to the Wild Horse Trail Run. 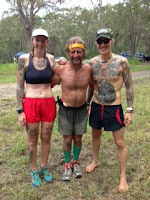 As mentioned previously, my sister was to do the 30km and my Dad, mate Lee and myself were to do the 70 (72.8km) events. 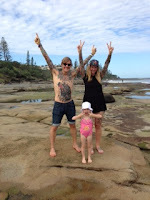 We had a relaxing couple of days before hand at Caloundra, before getting sorted for the main event. Our race was due to start at 2am. 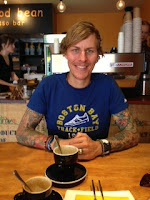 We headed down to the mountain earlyish and met up with Coach Jeff from The Running Podcast for a quick brew and a chat. We then went to the start/finish area and started getting our kit organized. After some mucking around and a few laughs, we lined up at the start line and before long we were off. We set off into the darkness at a reasonable pace, dodging puddles and having a laugh. 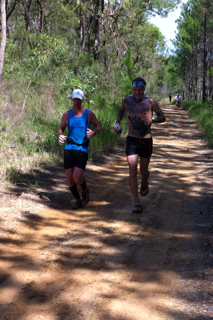 The first half of the 10.4km loop was pretty straight forward with only a few wet patches and some sandy sections. The second half however was a different story! There was a section that was like running on soft sand at the beach and then the rest consisted of some serious water crossings, some up to waist height and there was lots of MUD! Real slippery MUD! In my element, SUPER awesome Easter! In the year and a half that I have been running in my Luna Sandals I haven’t had any real problems however today was a different story! Once the mud got between my feet and the sandals they were SUPER slippery and I had basically no traction! Then we had to go almost all the way up Wild Horse Mountain and I had zero traction…then we had to go down a super steep side…again NO traction! Flippen frustrating, dangerous and slow going! I was pretty darn worried about this and thought I was going to be in for a super long day until I realized that if I went through some water, it fully restored the grip between the sandals and my feet! Yes! Although sometimes there was still some slipperyness going on, most of the time I was set! Very happy to have figured this out! We continued on through the darkness with the course working in a clockwise, anti-clockwise set up. We were keeping a pretty good pace and really enjoying it! Dad was a little behind us but kept pace exceptionally! As the sun started to come up we ditched our lights and continued on into the morning. We greeted the girls and kids for a quick g’day and kept plugging out the k’s. I kicked a couple of sticks which hurt a little and twisted my ankle decently about half way through. I kept going with minimal pain, but it came and went. Dad, Lee and I re-gathered and kept plugging along together. Dad was going super strong! I hit a bit of a low patch about 50km but kept moving pretty well considering. Things went by pretty much to plan, feeling the pinch bit by bit as we kept going along. After the second last lap stop, Dad took off and it was clearly his day! Lee was battling a fair bit so I decided to stay with him. I then started to struggle too so we encouraged each other along. 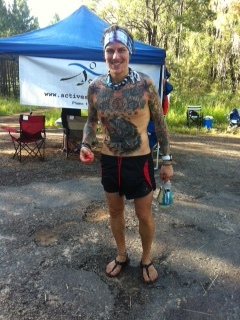 Throughout the laps we had a little dip in a running creek which was freezing and very refreshing. We did this again on our last lap before a short trot to the finish. Dad was the star of the day finishing in 8hrs and 27min. Lee and I completed the course in 8hrs and 34min. My sister also did really well finishing her first trail run, 30k in 3hrs and 48min. Lee and I at the finish. As usual we had our beautiful support crew of my dear wife (most amazingly supportive top lady ever! ), daughter Pria and our new baby on her first trail outing. Mum and Lee’s wife was also there to make up a great support crew. I just want to thank Alun for putting on an awesome event and a really top way to spend Easter Sunday. I also want to thank Chris at the Mower Doctor in Bundy for his on-going support in sponsoring my running adventures! Recovery is now on the cards and planning in place for the next outing. I hope you all had a safe and blessed Easter and are all now working off your Easter eggs! Catch up with y’all soon, stay safe friends and smile like a meerkat!